The sto­ry of the Gruppe Bochum (“the Bochum Group”) doesn’t just begin with Bochum’s brand­ing com­pe­ti­tion in Sum­mer 2014. The city’s pre­vi­ous image had long both­ered many Bochum cre­atives, and over the years had come up as the top­ic of con­ver­sa­tions held over and over again. Con­ver­sa­tions that had always led to the same conclusion:we need­ed to do some­thing about it. As pro­fes­sion­als and as cit­i­zens of Bochum. Togeth­er, as basi­cal­ly, despite the com­pet­i­tive nature of the indus­try, every­one in the Bochum adver­tis­ing scene knows and trusts one oth­er. Our ini­tial goal was of course to win the com­pe­ti­tion. But above all, we want­ed to com­bine our resources and do the best for Bochum. 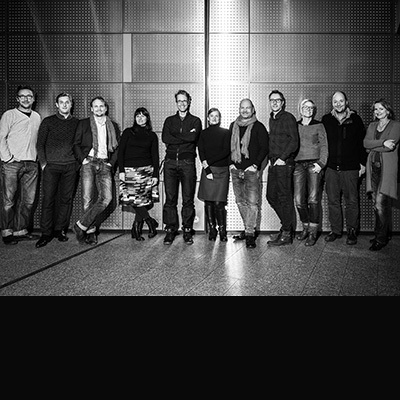 The Gruppe Bochum con­sists of nine agen­cies, along with oth­er indi­vid­ual cre­atives from Bochum: COMKOM° GmbH, Bet­ti­na Brakel­mann Text-Pro­jek­te, anders & agen­ten, Gre­gor & Strozik Visu­al Iden­ti­ty, Mar­tin Stef­fen Fotografie, Büro_Komplex, Okto­ber Kom­mu­nika­tions­de­sign, Radar Musik & Unter­hal­tungs GmbH, Design­stu­dio Stein­ert. The Gruppe Bochum will be rep­re­sent­ed at CXI by the COMKOM agency, Design­stu­dio Stein­ert, and Okto­ber Kom­mu­nika­tions­de­sign: Alexan­dra Stein­ert, Michael Stein­ert, Silke Löh­mann, René Wynands, Carsten Köchel. Whether adver­tis­ing exec­u­tive, mar­ket­ing expert, design­er, pub­lic rela­tions expert, copy­writer or pho­tog­ra­ph­er, we all want­ed to present what it’s like to live in Bochum – to show what the city has to offer. The com­pe­ti­tion for the brand devel­op­ment con­tract was the per­fect oppor­tu­ni­ty to real­ly tack­le this theme in depth. Our wide range of skills meant that our com­bi­na­tion was per­fect­ly suit­ed for the job of renew­ing the image of the city. We are expe­ri­enced in tak­ing an abstract posi­tion­ing and cloth­ing it in a liv­ing, visu­al form. But we’re just as aware of the job a brand has to do in the real world. We rep­re­sent both: ana­lyt­i­cal capac­i­ty and imple­men­ta­tion skills – and were able to pro­vide both for the imple­men­ta­tion of Bochum’s new brand­ing.